Choose File→New Event, press Command+N, double-click a date on the calendar, or drag up or down anywhere on the calendar. If you double-click or click and drag on the day of the event, you can skip Step 2, and you don’t need to specify the date in Step 3. Alternatively, try the Create Quick Event (+) button. It’s smart enough to interpret commands like “Family Movie 7–10PM Thursday” and create a new event on the proper day and time. If the event doesn’t appear in the proper place, just click it and drag it wherever you like. To edit an event, select it and choose Edit→Edit Event, press Command+E, or double-click it to open its event bubble. All the items in dark text can be edited. For example, click on the date or time to change it. The other items — Repeat, Travel Time, and Alerts — are pop-up menus. The Alert menu is popped. The blue square in the upper-right corner of the event bubble is also a pop-up menu, which lets you select a different calendar for this event. Travel Time is a new feature in Mavericks; it lets you include travel time to and from an event (and blocks out that time on your calendar), while preserving the event’s actual start and end times. When you’re satisfied with all of the event’s items, press Enter or Return or click anywhere outside the event bubble. If you prefer working in a little window rather than the event bubble, check out the Edit→Show Inspector command (Command+Option+I), which displays the selected event in a window. Click a different event, and its info instantly fills the Inspector window. Try it; you might like it. The difference between Get Info and the Inspector is that the Inspector window changes contextually and displays information about the currently selected event. Get Info windows, on the other hand, display info for a specific event. Put another way, a Get Info window displays the info for a specific event, and you can have as many Get Info windows on the screen as you like. To invite other people to your event, you can open Contacts or the Calendar Address Panel (Window→Address Panel or Command+Option+A) and drag the contacts onto the event in Calendar. Alternatively, you can type the first few letters of the name in the Invitees field, and names that match magically appear. 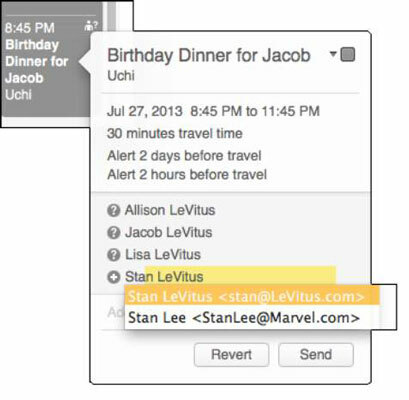 For example if you typed the letters st, Calendar would offer you a choice of your two contacts with names that start with st — namely, Stan LeVitus and Stan Lee. Sweet! After you’ve added one or more invitees, click the Send button to invite them to the event. If the invitees have Calendar (or its predecessor iCal), they can open the enclosure (which is included with your invitation e-mail), which adds the event to Calendar with Accept, Decline, and Maybe buttons. All they have to do is click the appropriate button, and you receive an e-mail informing you of their decision along with an enclosure that adds their response to the event in Calendar. Nice, eh? Note that if the recipient is using certain third-party mail clients, such as Mailsmith or Thunderbird, don’t send the reply. But the majority of people you know are more likely to use Apple Mail or Microsoft Outlook, which both do the right thing with invitations. If the invitee doesn’t have Calendar (or doesn’t open the enclosure that was included with the e-mail invitation), he or she has to respond the old-fashioned way: by replying to your e-mail or calling you on the telephone. When you add an alert, a new alert item appears below it. Just click the word None just to the right of the word alert (alert is partly hidden by its pop-up menu) to create a second (or third or fifteenth) alert. To remove an alert, click to the right of the word alert and choose None from the pop-up menu. You can choose separate default alerts for Events, All Day Events, and Birthdays in Calendar Preferences. 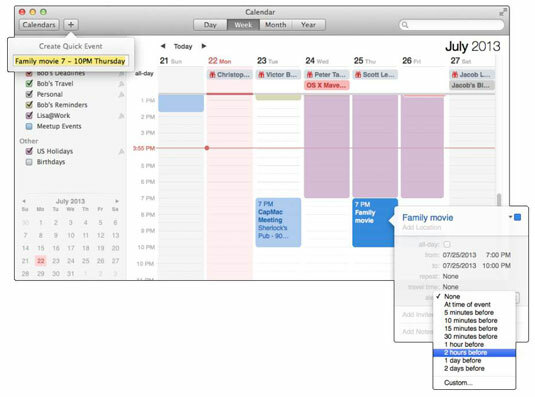 Choose Calendar→Preferences or press Command+, (comma), and then click the Alerts tab at the top of the window.